Jaws is this iconic, surfing mecca for crazy, suicidal type "A" water sports fanatics, in the vein of... "Don't try this at home" and "This is for professionals only." Jaws surfer. Photo taken by Rachel Olsson, a Maui photographer, who graciously allowed me to use her photo here. Jaws received a lot of attention from certain American Express commercials featuring well known surfer Laird Hamilton surfing on monster waves. Jaws is aptly named for the huge waves that happen only a few times a year, when there is a large North Shore swell. It's usually only during the fall through the early spring, maybe 10 times or so each year. It's a source of constant murmuring during the winter months: "Is Jaws going off?" "When is Jaws going off again?" "I heard Jaws went off last week..." "Did you see Jaws?" Those who have seen Jaws in full throttle are smug... those who missed Jaws sigh and try to catch it next time. The following video (only 3 minutes) shows clips of surfer Laird Hamilton, including many shots of Jaws. Is Jaws a classic symbol of Hawaii? Is it a stereotypical motif that people associate with Hawaii? Well, it's certainly famous, it starts with a J, so I'm going to take the ball and run with it. Just about everyone who lives on Maui knows about Jaws, and a fair number of tourists. 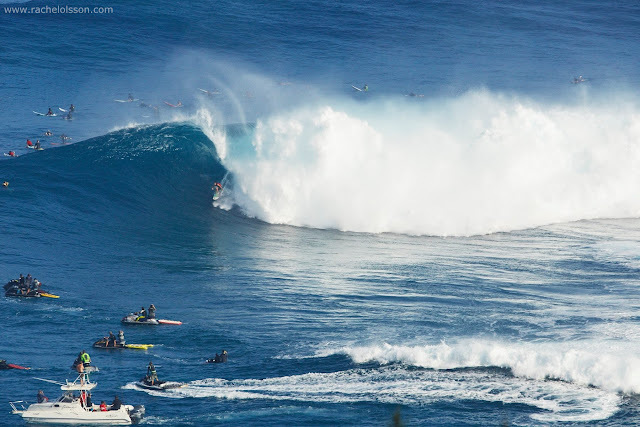 The Hawaiian name for this surfing location is Peahi. There are so many excellent surfing videos and pics of Jaws, you could watch them all day until your jaw dropped open. A great resource is Jimmie Hepp's Facebook photo album. 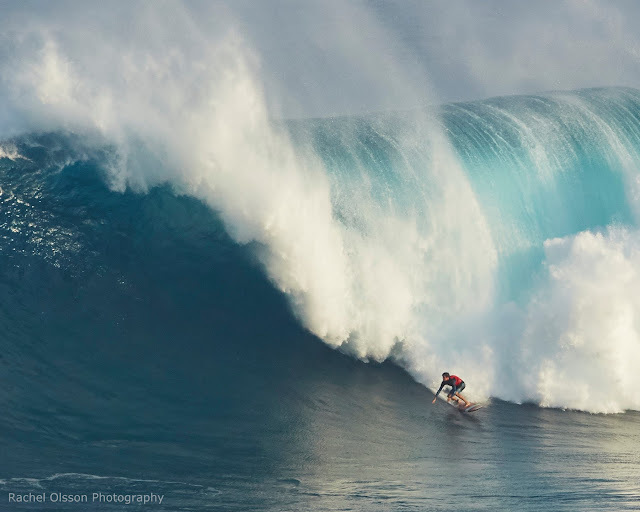 Another great photographer is Mike Neal who can frequently be seen at Jaws. AND, mahalo to Jeff Rowley for sharing his creative commons photos of Jaws. Please check out these websites. Jaws is only five miles from my house, right off the highway in Haiku, Maui, and yet I've only managed to see it a few times, and not in the best conditions. Go to Haiku, look for the intersection of Peahi Road and Hana Highway, and follow the caravan. If there's no caravan of cars, then Jaws is not "going off." People will skip work when Jaws is going off. The other name for Jaws is Pe'ahi (pronounced "pay-(pause)-ah-hee" with a long eee sound at the end). Ideally, you find out about Jaws the night before, because you got a tip that there's a big swell (big waves) on the North shore (or you listened to the surf report). If you're a surfer or connected to surfers, you'll hear them talk about going to Kahului Harbor that morning and taking some boats to Jaws. Then you go out early on this bumpy, often mud soaked road and get a spot facing the ocean. There's usually tons of cars on the side of the road, so it's easy to figure out where to go. The waves are so huge that it's difficult for a surfer or windsurfer to get up on the wave without some help. The boats or jetskis help to "tow in" the surfer to catch the wave. It's a huge "dog and pony show" if you consider Jetskis, boats, and helicopters as part of the show. There are always extra boats in the water to take close up pictures and to assist if there's an accident. There are many boats and surfers in the water. Photo by Rachel Olsson. Mahalo Rachel for sharing this photo. There's a couple of different vantage points too. You can watch from high above, which is what most people do or clamber down the side path around the hill and down to a rocky beach where you can watch it from the shore. Don't park on the side of the highway if you don't have to. I've seen cops ticket cars there! Bring food, water, a good camera, hat, sunscreen... maybe a beach chair. The wave action can change during the day... going through lulls and gentler waves and then ramp up... so be patient if it's not doing much when you're there. You can't really get lost. The road is kind of like a big loop, so it feels like you are wandering out to nowhere, but eventually you will get to the ocean, and when you leave, just follow another car, and just when you think you are lost and going in circles, you will eventually make it to the highway. You may also enjoy: Jaws and the Beach. P.P.S. If you're blog hopping from the A to Z Challenge, please include a link if you comment. Wow, those waves look huge. I'll bet it is quite a spectacle when Jaws is going off. Sounds like it would be fun to go there once and watch those guys try and surf the monster waves. You too! Happy J Day! Not much surfing happens here in Colorado :-) But my book club recently read Susan Casey's The Wave, so I learned a lot about Hamilton and surfing and how wild and crazy the ocean is. Pretty amazing stuff. Have fun with A to Z! Boy. That was a long post. Wonderful photographs though. A few of the people I knew in the past spent time right where you are to surf the waves. I'd never heard about the big-un though. Those are some HUGE waves! We don't get big waves over here at the Atlantic Ocean so no surfing for me. That is awesome!! And now another stop when I finally get to Hawaii!! How cool that you live so close!! Our beaches have big wave but nothing as large as yours. Still, we will drive to the beach to see them when we get the storm surges. I think Jaws is a little frightening just by the size. It must be loud but it sure is impressive.